So just in case you didn't hear - Momofuku Ssam Bar/Milk Bar was closed yesterday due to a health scare after a new employee tested positive for hepatitis A.
momofuku ssäm bar has confirmed that a newly hired employee tested positive for the hepatitis a virus. in response, we immediately notified the new york city department of health and mental hygiene, and began preemptively testing and vaccinating our staff. 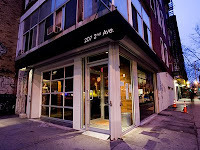 pending testing results and further analysis, the new york city department of health and mental hygiene has not required or requested that we close the restaurant or notify our customers. though there is a low risk of outbreak, all staff members have been vaccinated as a precautionary measure. the new york city department of health and mental hygiene inspected the restaurant yesterday and noted 0 violation points. we will be open for dinner service tonight. press release from the new york city department of health and mental hygiene the health department investigates all cases of hepatitis a in new york city. of the 120-150 cases confirmed annually by the department, fewer than 10 occur in foodservice workers and the health department sends an inspector to the site to evaluate whether there is a risk to patrons. the department was notified of this case on june 8, began the investigation, and inspected the bar the same night. the inspector found no health code violations. violations that may compromise hand washing and hygiene are of particular interest when there is a hepatitis a case involved. The restaurant is open as of dinner last night - but I don't know about you guys - I'm a little wary. Maybe especially since I just went to Milk Bar on Sunday - June 8.